Ringo immortalized the sentiment, but let’s get real, we all get by with a little help from our friends. Hell, who among us can truly function as an island in this sea of shared chaos? We take what we need, give what we can and all shine a little brighter on account of the energy in that reciprocal do-si-do. 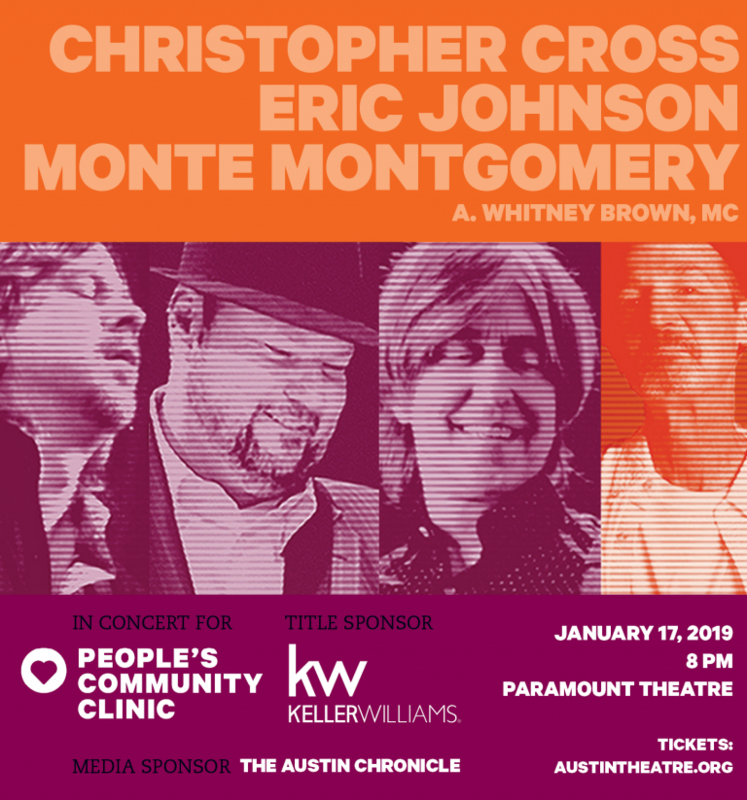 And that’s exactly what went down last Thursday night at the Paramount Theater where Monte Montgomery, Eric Johnson, and Christopher Cross lit up and let loose for a one-off show benefiting People’s Community Clinic. Started in 1970 as People’s Free Clinic, it was a place, according to Saturday Night Live alum and Master of Ceremonies A. Whitney Brown, for hippies to take care of their gonorrhea. From those humble beginnings, it’s evolved into a health care institution, launching one of Texas’ first HIV counseling and testing programs in 1985 and later becoming a Federally Qualified Health Center in 2012. CEO Regina Rogoff calls it a “clinic for the people, by the people”, and last year PCC served over 17,000 central Texans with little or no access to health care. Monte Montgomery got the party started with a set that included “Took Too Long”, “Tropical Daydream” and a hair raising rendition of “Bringing Me Down”, which covered a staggering breadth sonic terrain. Some might call it an axe, but Montgomery’s intricate fingerpicking, aggressive strumming, and dizzying slide work made it seem as though he was a wizard casting a thunderstorm with an enchanted wand. 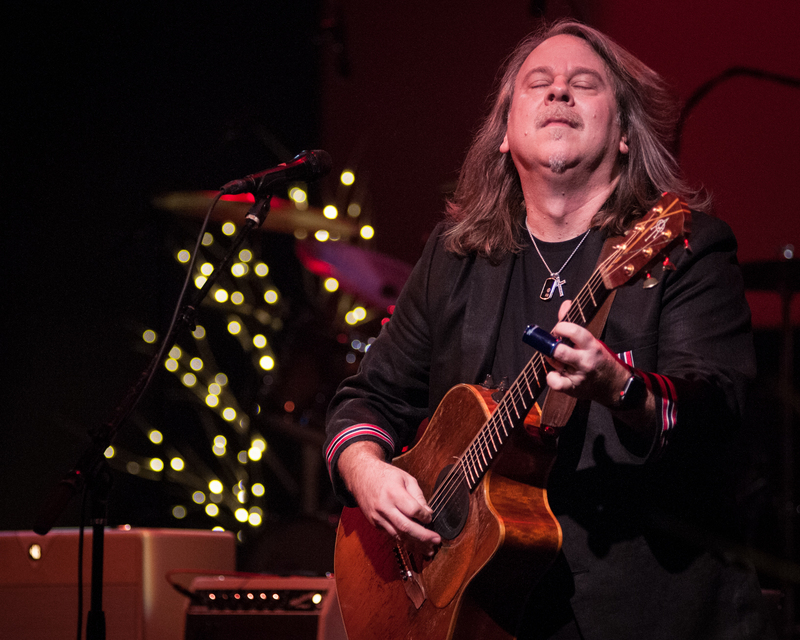 Blazing licks and harmonics bounced off his strings like particles of light erupting from a sonic volcano, leaving no doubt as to why he has won the Best Acoustic Guitar Player Award at the SXSW Austin Music Awards seven years in a row. As hoots and hollers for Montgomery’s set subsided, Brown returned to the stage to encourage the packed house to tackle a couple of tequila shots during the ensuing intermission. 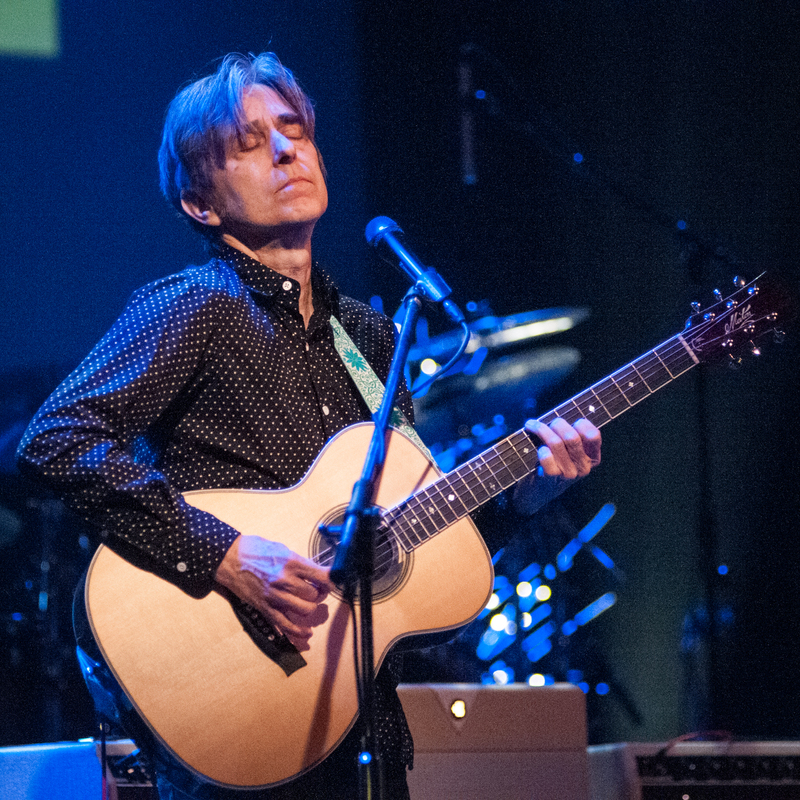 When the house lights dimmed once again Eric Johnson stepped into the spotlight and proceeded to strike a musical match, shredding his set like a surfer carves a wave. It was a torrential flurry of virtuosic precision that threatened to tear a hole in the space-time continuum, and when the rollicking waves of his signature tone crashed against the “Cliffs of Dover” the crowd lost its collective mind in a frenzy of cathartic euphoria. The standing ovation that followed was anything but obligatory. 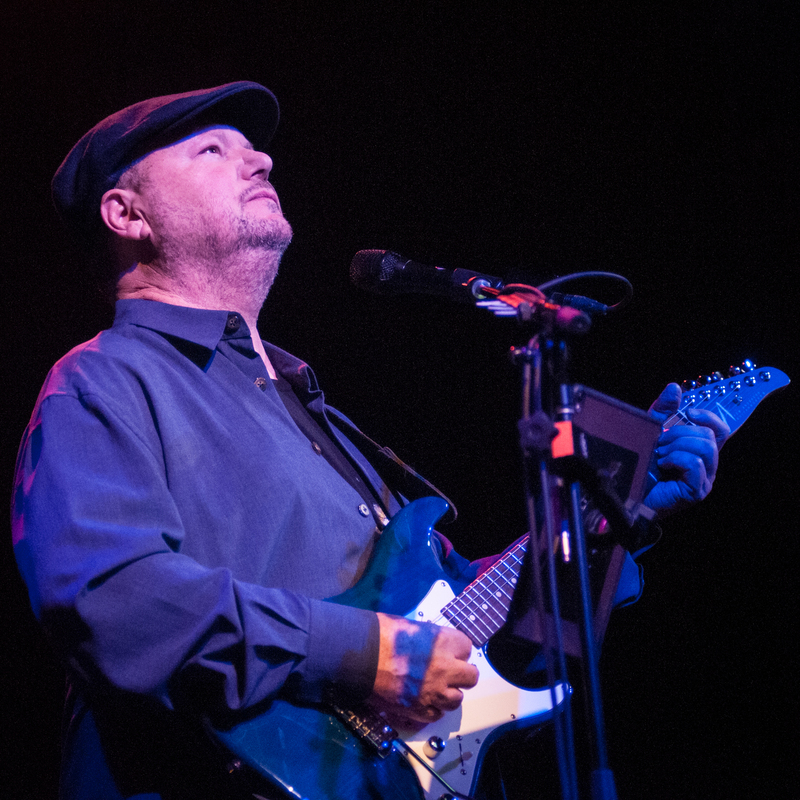 Following a short break, during which Brown shared a story about smoking a joint with Paul McCartney, Christopher Cross took the stage and filled the room with hits that included “Sailing” and “Arthur’s Theme (The Best That You Can Do)”. Tightly played and airy, the set highlighted why he’s been such an enduring favorite in the Adult Contemporary scene since his meteoric rise to fame in 1979. Not only did Cross’ self-titled, debut album take home Album, Record, and Song of the Year at the 23rd Annual Grammy Awards, he walked away with Best New Artist, making him the only artist in Grammy history to win all four awards in a single year. Meteoric indeed. The reception and respect for these artists, their music and the cause bringing them together hit a rolling boil following Cross’ set, and upping the ante on an already inspired night of music, Johnson and Montgomery joined Cross and his bandmates for an encore. John Lennon’s iconic “Imagine” was fitting, proving once again that music is more than ear candy; it’s a force that inspires action and concern for the greater good.